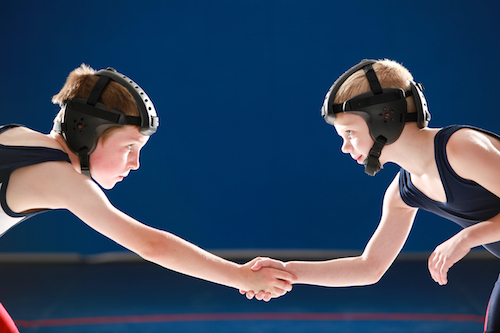 High school and youth wrestling season is almost here! Coordinating with your league, registering wrestlers, managing money, and finding new volunteers can create a long list of to-do items over the next month or so. Take a couple of deep breaths and follow these tips to get ready for the wrestling season in about 20 minutes. Make sure you get schedules posted as soon as you have a good estimate on when registration begins, when your first practices will be, and when the season wraps up. Families want to know months in advance when the season starts, if there is any time off during the season, and when they can expect the season to end. Families that are new to wrestling may not be very familiar with how your season is structured, so make sure you over communicate. Don’t worry if you don’t know the date of every match or tournament. Just post important meeting dates, postseason events, and practice times for now and you can add more events later as dates and times are finalized. Make sure you post the information online so you can easily add and edit events before and during the season. Setting up the ability for wrestlers to register and pay online has never been easier. Ditch the heavy lifting of paperwork, cash, and checks and move all of your registration online this year. You won’t have to spend a weekend buried in extra work, and you’ll be able to offer parents a convenient way to get registered from home. Already using online registration? We have a few tips to simplify online registration this year. PRO TIP – Looking to raise a little extra money this season? You can also give parents the option to sponsor or donate to your club during registration. Tip #3 – Recruit some new volunteers! Don’t get half way through wrestling season and realize you’re doing all of the work yourself. If you spend most of your time coaching, make sure you offload most of the administrative responsibilities to another parent or volunteer. If you prefer to do the administrative work, be sure you’ve got plenty of volunteer coaches. It’s simple request information from parents during registration about their willingness to volunteer. You can even give discounts to parents that decide to help out (or charge extra to parents who don’t volunteer). Just ask a question about what/when/where they’d be willing to volunteer. Has it been tough to schedule volunteers in previous seasons? Systems like Volunteer Spot and SignUp Genius can help you collect volunteer information and manage scheduling. Also, don’t forget to send a quick email and/or text message to all of your contacts to gauge their availability to volunteer a few days before big events! Social media is a daunting world. There are so many different options and each channel requires a different strategy. Who can keep up? Bill Belichick sure can’t. 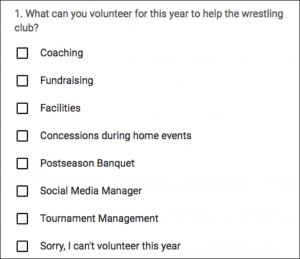 If you’re volunteering to run a wrestling club make sure you keep things simple. We recommend choosing one channel and doing it well. Don’t try to do it all by running 3-4 different channels, otherwise your followers will all be in different places and you’ll have to do 5x the work. Are you using Facebook as your primary communication channel? You’ve probably seen some news about Facebook, and you may want to reconsider relying on Facebook for communication. It probably won’t be as reliable this year due to some changes. Learn more here – The Problems with Using Facebook for Communication this Season. PRO TIP – Choose Instagram as your channel and scrap the rest. Instagram is a great place to post photos of events and you can probably find a parent who would love to help manage the Instagram feed. Plus, Instagram is the most likely channel for your wrestlers to follow. Alright, we squeezed all of these items into 20 minutes. Even if they take slightly longer, you can still get them all in during your lunch hour! Anything else you’re doing to get ready for the season? Don’t have an hour and would like our help getting things started? Send us a message at help@jerseywatch.com!